Still, for years after I started running again I wasn’t a racer. I gave up when the going got tough. I hated it. I hated worrying about waking up early, getting to the start line. I hated the pressure I put on myself and the little devil on my shoulder who I knew would tell me to walk. But then I joined a running team. From my very first workout on the track, they believed in me. They believed in me before I did. I worked hard for almost two years with the team, was hugely inspired by all my teammates who were PRing and running marathons and ultramarathons and Ironman triathalons, but still tended to give up on myself during races — especially longer ones. A half marathon in Malibu that was supposed to be my breakthrough was another subpar day (and the hills! Oh god, the hills!). It was the pressure I put on myself, I know. It wasn’t until I worked myself into a pretty nasty case of bronchitis before the 2014 NYC Half that everything finally fell into place. I kvetched for about 24 hours to friends about how much I didn’t want to do it, so terrified was I of, well, I didn’t know what. But just before we entered the corrals I told myself to let it all go, you’re sick, what will happen will happen, and I PR’d — finally — by about 10 minutes. After that hurdle I was no longer terrified of racing. After that hurdle I knew I could run a full marathon. Fast forward to November 23, 2014. In the week before the marathon, I went through my days of terror — of what, I still didn’t know exactly. But I was able to take that terror, let myself experience it for a limited amount of time, just to taste it and then spit it out. By 4:30am on Sunday morning I was jumping out of my skin with excitement. Who knew what the day would bring — what those last five miles, which I had never run before, would bring — but I was going to soak in every single moment, no matter the pain, no matter the difficulty. This is why when I first started my training in July, I told myself I would be satisfied just to finish — I’d be okay with finishing in five hours, I said. I’d be happy with 4:45. I’d be thrilled with 4:30. Then, as my long runs got longer, and my pace lowered and still felt easy, I started adjusting my expectations. 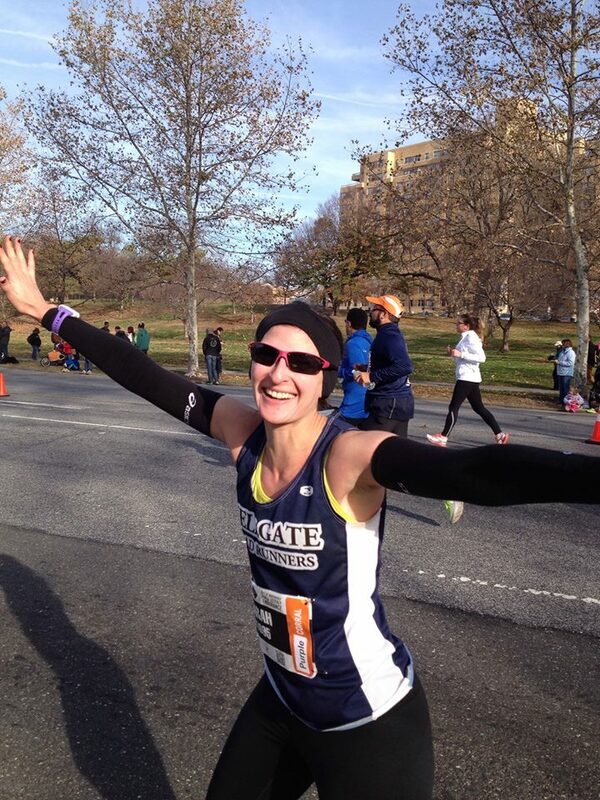 The week before the marathon I decided to aim for a 4:22 finish: a straight, 10-minute pace. But I would still be okay if I was slower. Anything can happen over 26.2 miles. I crossed the start line smiling like a fool, and I didn’t stop. Every single person who cheered me on by name — and it seemed to be a lot — I thanked. I looked at all the signs, laughed, high-fived, sang along with the “Fresh Prince” theme song when we had crossed into West Philly. And along the way I found inspiration where I never expected it — or rather, it found me. Around the 16-mile mark, a woman in a blue top and an ice-blue sparkle headband came up to me and asked if I would mind if she trailed along behind me. Her husband decided to fork off with the half marathoners, who had started at the same time, and she had only trained up to 14 miles. I told her I would love the company. Her name was Liz. She told me that she, her husband, and her brother were running this in memory of two of her other brothers who had both tragically passed away in the last year — one in a car accident after going into remission from cancer, and the other during surgery to remove a brain tumor — and a friend who had also died. When I told her my name, her face lit up. The friend’s name was also Sarah. Liz and I ran together for five miles. We kept each other going, silently at some times, with chatter about our lives at others. “If we hit 18 miles, I know I can do it,” she told me when we were at 17.5. “When we get to 20, we’ve got this.” We parted around mile 21, when she caught up with her brother, who was slowing with increasing pain from a stress fracture in his leg. She took a picture so she would never forget me. I will never forget her. I ran the last five miles alone, wishing the water stations weren’t so far apart, wishing for more people along that lonely part of the course to cheer me on. I slowed, from exhaustion and from my hips tightening. I felt like I was barely moving at times, felt like I was outside myself. But I kept going. Stopping, or even walking between water stations, was never an option. I finally hit the last water station near mile 24, fueled up with my last gel, took a moment to stretch my hip flexors and the muscles around my knee, take a deep breath, and kept going, hoping the finish would miraculously appear. It wasn’t far from there that an older gentleman, cheering from the sidelines, called me out by name and told me to dig deep — less than two miles to go. I stood up a little straighter, smiled. I pulled my soul back inside myself. Mile 25: the crowds started to thicken. I started scanning for my fella, my family, who I knew would be somewhere between here and the finish. The energy was intoxicating. I quickened my pace. Just before mile 26 I saw them. I threw my arms in the air in jubilation. All of a sudden I was free. I had wings. I flew. 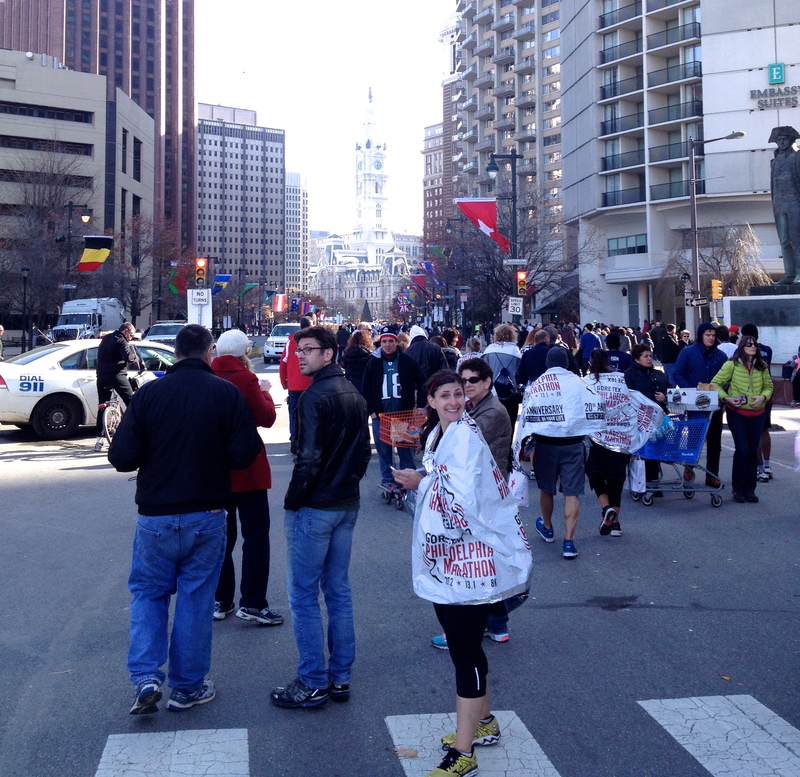 I finished the 2014 Philadelphia Marathon in 4:22:58. I had just made it. I finally found what was always inside myself. I cried, because I ran a marathon, because it felt so damn good, because now I knew I could do anything. I want to bottle up every single moment of those hours and carry it with me wherever I go. I want to sprinkle bits of it into everything I bake, every word I write, from here on out. I’m mixing it with cinnamon and nutmeg and brown sugar for this Thanksgiving Apple Pie. I hope you feel it, too. I have been the go-to apple pie baker in my family for years, especially ever since I tossed aside the Pillsbury pie crust and started making it from scratch eons ago. We’ve never looked back. I have, however, constantly searched for new ways to make my pies better. The flavor — the combinations of sugars and spices — is set, but I was always dealing with a soupy mess, and with space between the top crust and the gigantic pile of apples that would shrink with cooking. I really wanted a mile-high pie, but therein lies the problem: the ratio of crust to apples is off when you use more than, say, three pounds of apples. 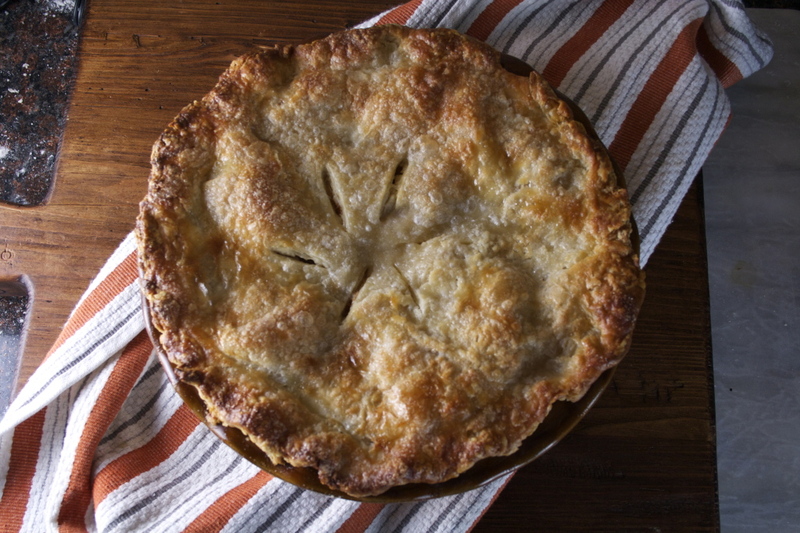 To fix the problem you either have to par-cook the apples, or just make a regular ol’ flat-topped pie. I tried the par-cooking method and loved it, but it was more like a drier, more tart breakfast pie. There wasn’t enough apple goo, and my family is an apple goo kinda family. Joy the Baker’s pie was the answer. 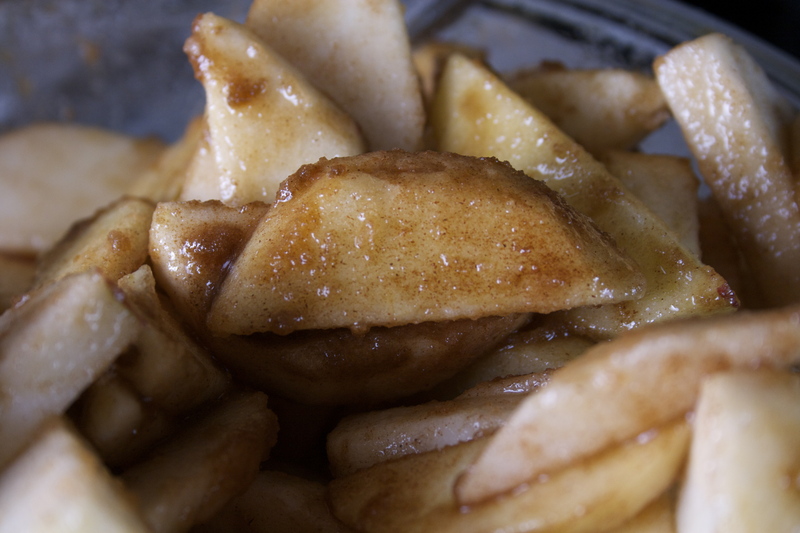 She macerates the apples in the cinnamon-sugar mixture, and then boils that liquid down until it caramelizes, pouring it back over the apples, which have been tossed with cornstarch. I made only slight modifications, leaving out the lemon, as I prefer my pie to have a solidly earthy flavor, baking near the bottom of the oven at a slightly higher temperature, and a few other small things here in there. I used a combination of Granny Smith and Cortland apples — my family’s favorite. This pie, with its buttermilk crust, is brilliant. It tastes the way pie is meant to taste. So what if there aren’t five pounds of apples shoved in? It’s made of marathons and magic. Remember to keep all the ingredients for your crust very cold. I like to freeze my butter for several minutes after cutting it into cubes, and if my kitchen is very hot, I will also put my bowl and flour in the freezer before adding the butter. 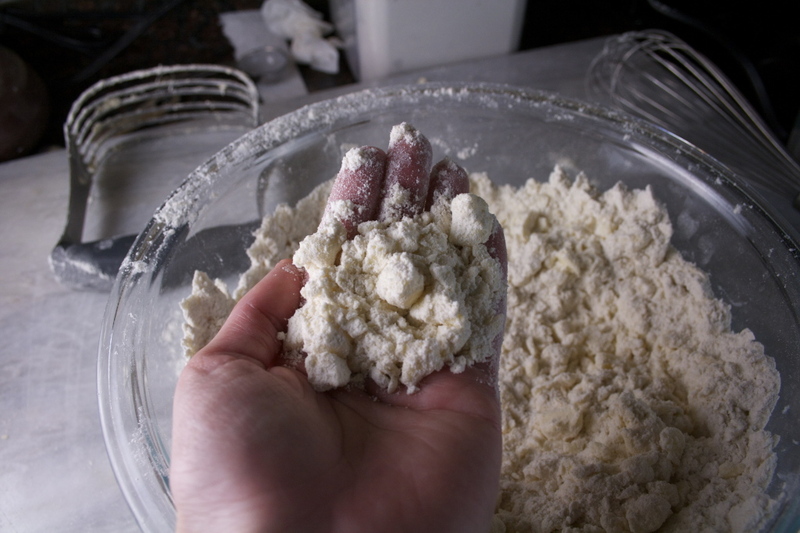 In a large bowl, whisk together the flour, sugar, and salt. Add the butter and toss with your fingers to coat. Using a pastry cutter (which is what I use) or your fingers, cut the butter into the flour until the butter is the size of small and large peas. 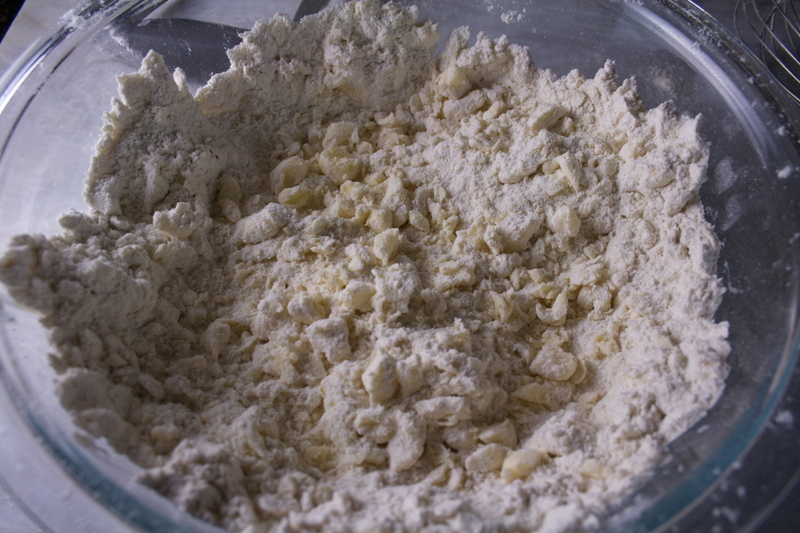 Make a well in the center of the flour-butter mixture and pour in ½ cup plus 1 tablespoon of the buttermilk. Use a rubber spatula to bring the dough together. It will be quite dry. If it’s too dry to clump together, add more buttermilk, 1 tablespoon at a time, but no more than 2, otherwise the dough will end up being quite tough. Even if it’s dry the flour will hydrate later in the fridge. 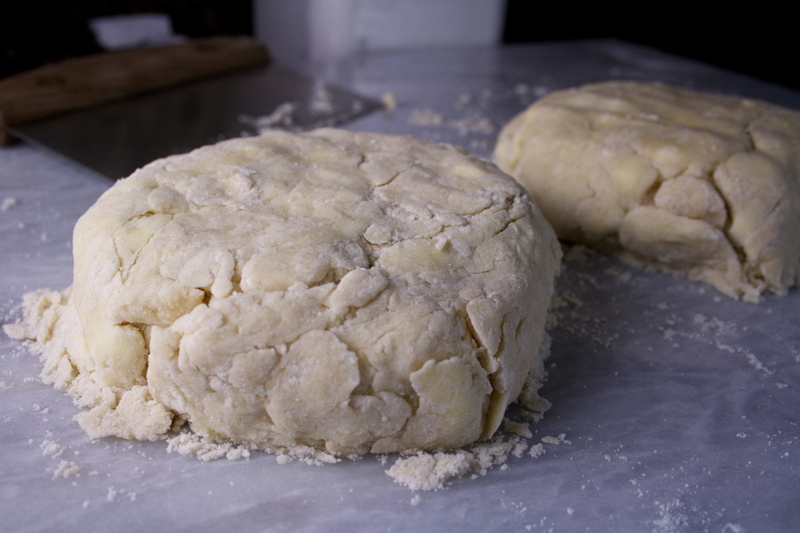 Turn the dough out onto a lightly floured work surface and knead gently until the dough comes together. Cut in half and shape each half into a disk. Wrap each in plastic wrap and refrigerate for at least 1 hour or up to 48 hours. 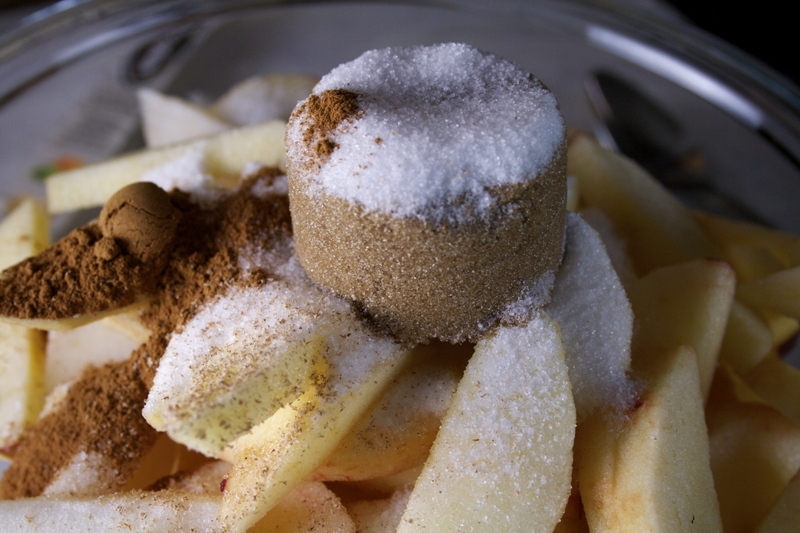 In a large bowl, combine the apples, brown sugar, granulated sugar, cinnamon, nutmeg, and salt. Transfer the apples to a colander or fine-mesh strainer and set it back over the bowl for at least 30 minutes and up to 3 hours. The sugar will pull the juices from the apples. By the end you should have at least ½ cup of liquid. 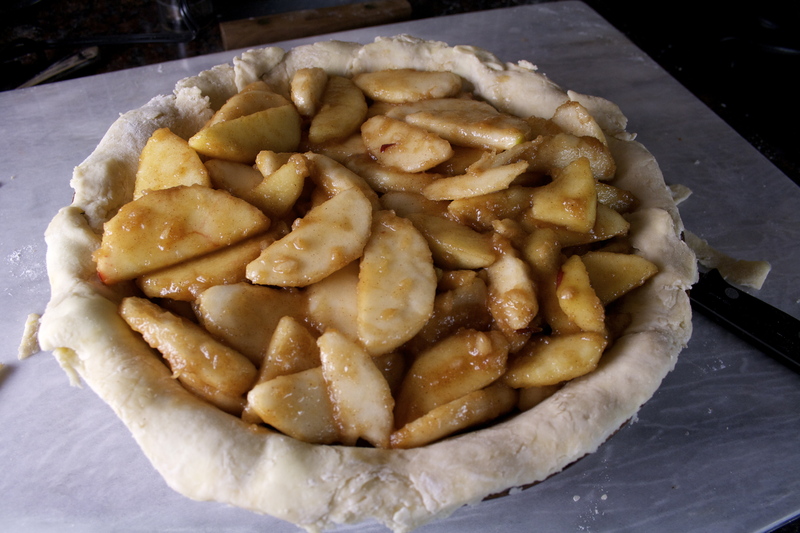 While the apples are macerating, remove one disk of dough from the refrigerator and roll it out to a 12-13 inch circle on a well-floured work surface, lifting and rotating the dough a quarter-turn occasionally to keep it round and prevent it from sticking, adding more flour if it does. 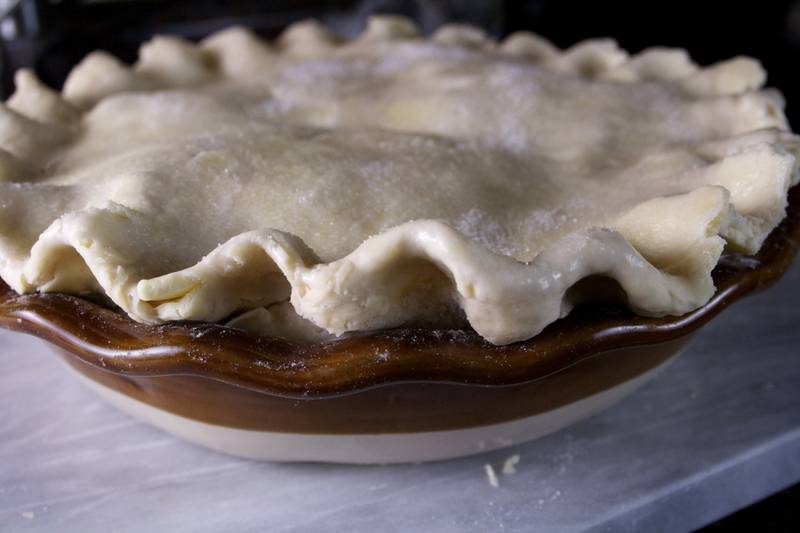 Transfer the dough to a 9-inch pie dish. Cover with plastic wrap and refrigerate at least 30 minutes. Roll out your top crust the same way, and transfer it to a parchment-lined baking sheet. Cover with plastic wrap and refrigerate for 30 minutes. At this point adjust an oven rack to the lowest position. Place a foil-lined baking sheet on the oven rack and heat to 425 degrees. Pour the liquid that accumulated in the bowl into a small saucepan and bring to a boil over medium-high heat. Add the butter and cook, swirling gently, until it’s syrupy and caramelized and reduced down to about ⅓ cup, about 5 minutes. Meanwhile, transfer the apples back to the bowl that had contained the liquid and toss them with the cornstarch. Pour the caramelized liquid over the apples and toss to coat. Remove the pie dish from the oven and pour the apple mixture in the pie shell, mounding the apples slightly in the center. Place the top crust over the pie. 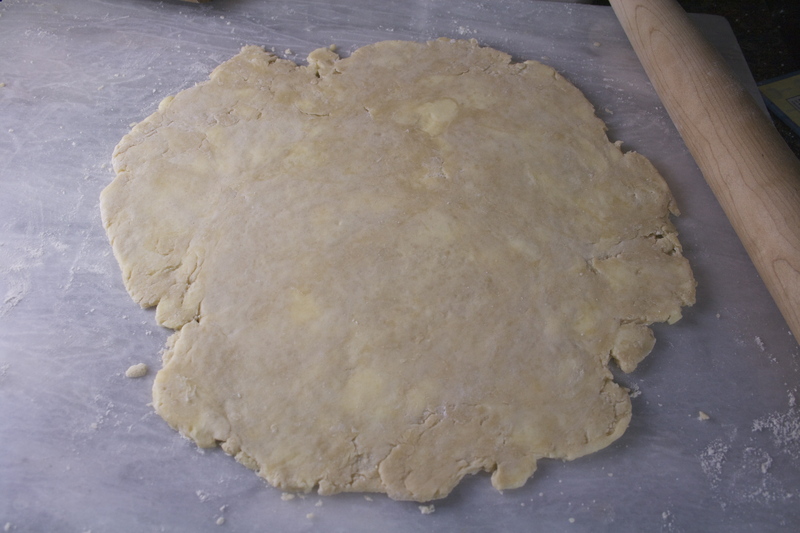 Trim the edges if necessary, and tuck until the bottom crust, pressing to seal. Crimp the edges and cut 4 or 5 vents in the top. 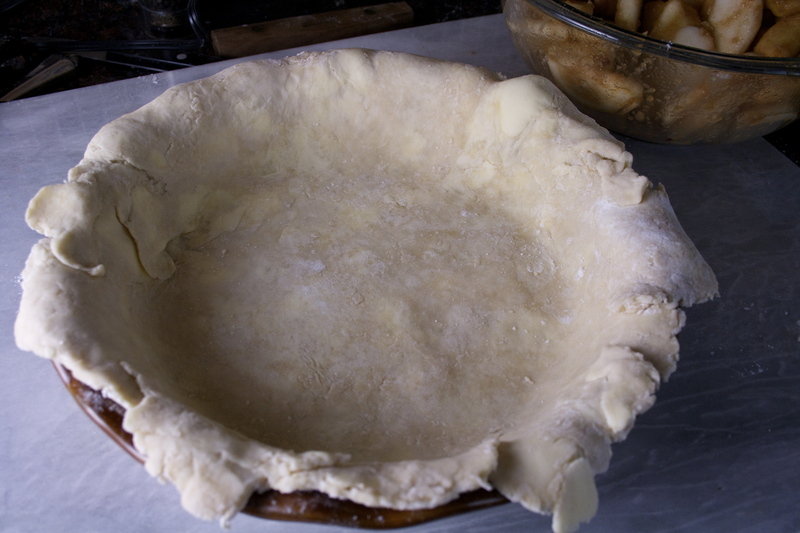 Brush the top crust with the egg wash and sprinkle with the 1 tablespoon sugar. 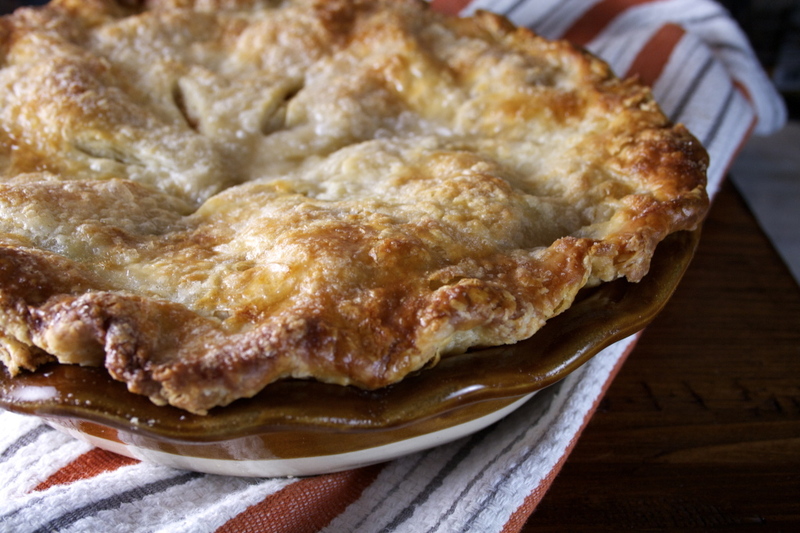 Place the pie on the heated baking sheet and bake until the crust is golden, about 25 minutes, and then lower the oven temperature to 375 degrees. Rotate the baking sheet and continue to bake until the juices are bubbling and the crust is a deep golden brown, 25 to 30 minutes. If the edges begin to brown before the rest of the pie, create a ring of foil and place over the edge until the rest of the pie is ready. Let the pie cool on a wire rack until the filling has set, at least 4 hours. Serve warm or at room temperature. Such a creative post! 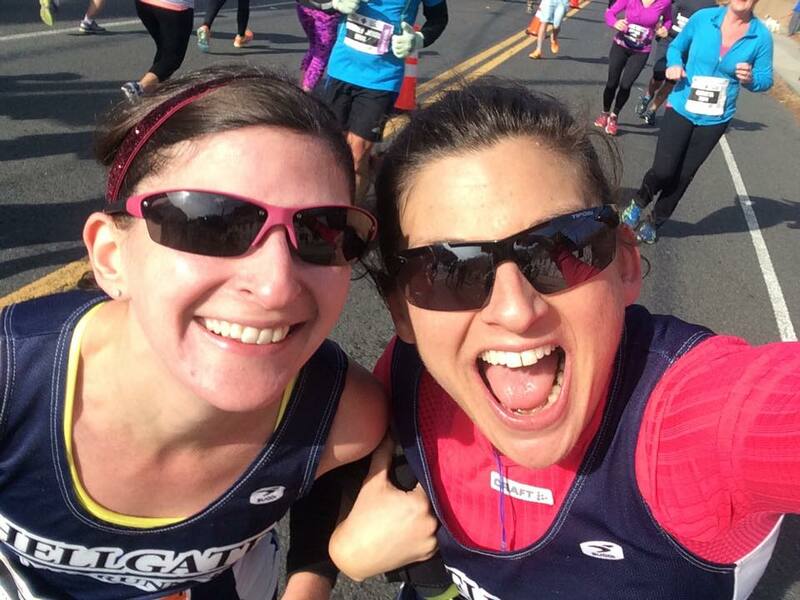 We added your link to our list of race recaps!